Featuring a 25mm barrel for super tight curls with extra bounce, the BaByliss Pro Titanium Expression 25mm Curling Tong is a must have. 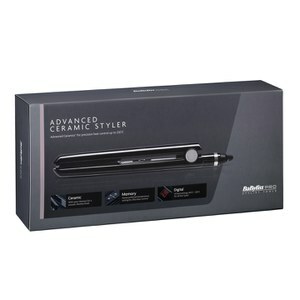 Designed with classic style, this curling tong features ultra-advanced ceramic heaters for constant, regulated temperature control and 11 temperature settings, with a top temperature of 210°C. The cool safety tip, auto shut-off and heat mat ensure maximum safety whilst the salon length 2.7m swivel cord allows maximum movement. K.D. Attenzione: questo accessorio ha la spina di corrente inglese.